MultiVAC is the next-generation public blockchain designed for large-scale and complex distributed applications. MultiVAC's vision is to enable large-scale commercial DApps to integrate smoothly into our ecosystem, enabling everyone to quickly and easily use blockchain applications to improve their work efficiency and quality of life, thereby creating a trustworthy, fair and harmonious society. It is a pity IEO projects still ignore ICObench platform (don’t pass KYC here for example) Most likely because they are too fast and too supported to get promotion and fundraising. And certainly exchanges try their best to make all checking themselves. So this is the first Kucoin exchange based IEO. They have pretty good team and launched the Testnet. The main problem for all IEO yealy supporters is to exit before the great dump occurs which goes just after the great pump. Good luck! MultiVAC is building themselves a potential category leader in a market for distributed systems with a new cryptographic proof and sharding technology. The value of their technology is built on a cryptography approach for a verifiable random function (VRF). It works with a secret key to compute the function value to verify the proof. Without the secret key, one can still verify the proof with a public key. Infrastructure systems built for enterprise applications can leverage MultiVAC in their development to verify inputs like names, email, social tags, addresses, message queues, timestamps across high speed computing transaction. An example of its use is a Facebook post could provide verification value the post is credible or not credible with lightning speed. An attack on the Facebook post would not be subject without the attacker having the secret key. MultiVAC is developing a sharding algorithm to apply across the infrastructure of transactions, computation and storage. 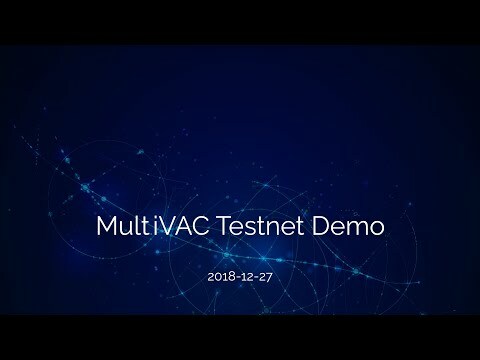 The advances in cryptographic proof built by MultiVAC provide a higher level of safety and reliability for enterprise applications with minimal nodes on the system for super light speed computing of smart contracts, a core value proposition for software developers of blockchain infrastructure using an instruction set to values and proofs to validate the purity of correct values in smart contract transactions. The team is suggesting a late Q2 release of the Mainnet in 2019 with a follow-up release of SDK in Q3 2019. Serious validators from the blockchain community would provide better insight to the team and product are delivering on the roadmap. KuCoin announced they will be launching their ICO April 3rd. They have received private funding of 15 million USD in Series A from IDG, NGC, Hashed, Signum, Arrington XRP, and Dfund. New record sales speed in IEO: $3.44M for 7 seconds!